The ultraviolet telescope aboard the 5E5 satellite made the first comprehensive ultraviolet stellar survey from orbit in 1965. Map, to a high degree of accuracy, the earth's magnetic field at orbital altitude. Map the celestial sphere in the ultraviolet region. Demonstrate satisfactory operation of a new digital solar attitude detection system. Determine sublimation rates of selected metals. Continue solar spectrum studies from orbit. Determine the reliability of various selected transistors and capacitors in orbit. All satellite 5E-5 launch objectives were met. 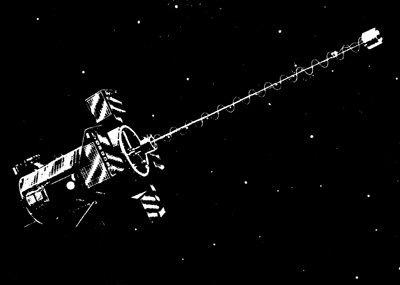 The rubidium vapor magnetometer sensing head mounted on a 16-foot telescoping boom was extended on command on 15 December 1964. This boom separated the sensing head from the magnetic field of the satellite body so that the ultrasensitive scalar magnetometer received minimum artificial bias. The 5E-5 scalar magnetometer system was complemented by a three axis fluxgate vector magnetometer system. After a period of erratic behavior, the rubidium vapor magnetometer gave useful data in middle and low latitudes during the period of 17 April to 8 June 1965, when sunlight illuminated the entire satellite orbit. These data as well as the values obtained in the last two weeks of December 1964 were compared and. the results computed using the existing theoretical model. Residuals in this comparison were used to determine an improved set of harmonic coefficients. The ultraviolet telescope furnished excellent data until June 1965. The identification of ultraviolet sources was dependent on the reduction of the vector magnetometer and the heliogoniometer system data as well as the satellite position information derived through doppler tracking. The heliogoniometer system located the satellite sun line to within one-tenth of a degree. In-flight calibrations accomplished both by a stellar source and an artificial source included in the photometer package established that the photometer sensitivity remained constant for the three months following launch.